Conventional restaurant layout has been put aside. Lagranja’s intent with Pur for Nandu Jabany was to make the entire space a working kitchen – with the intimacy of small theatre. 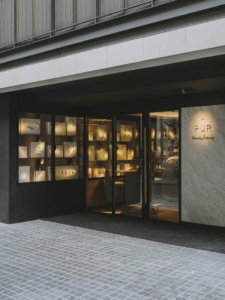 Situated in a small passageway in Barcelona’s upmarket Eixample district, diners become part of the gastronomic process the moment they step in the door. A state of the art kitchen, marble bar and oversized plate-up area (designed to look like a giant chopping board) take centre stage – where all the preparation and cooking is done. Diners view the proceedings from curved banquettes – designed for 4 – placed around it, from where they can follow, at close range, every moment of their meal being prepared; from the chefs selecting the ingredients from the stainless steel cool room, to cooking processes and serving (the chefs themselves wait at the tables), making the experience more akin to eating in a private home. 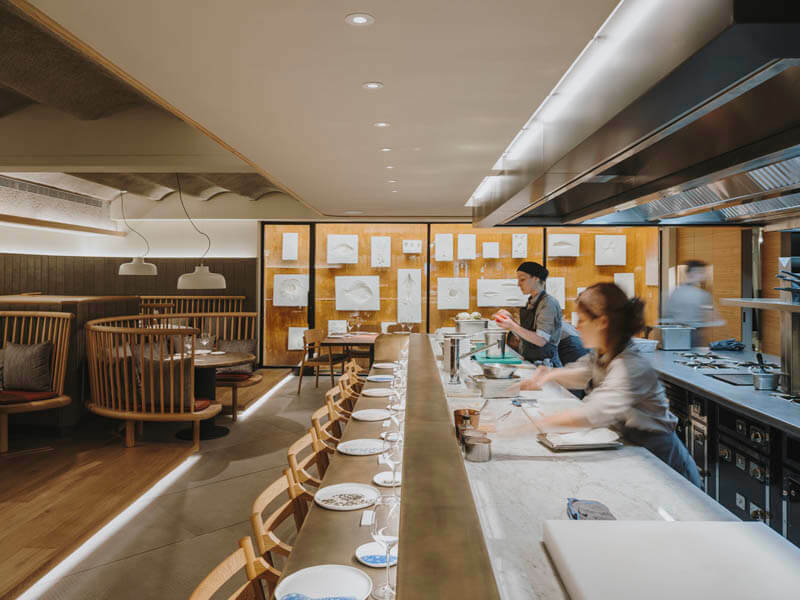 To convey this enhanced level of integrity and transparency, Lagranja chose a language of hand crafted materials and processes that celebrate Catalonia’s culinary richness. From the lab in their studio, over 200 casts were created with fresh foodstuffs – seafood, fish and various fruits and vegetables – which became charming, one-off decorative pieces. 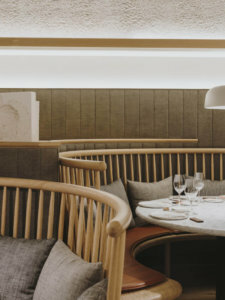 In keeping with the restaurant’s ‘pure’ ethos, they were left unpainted, and have been placed in the glass-enclosed interior patio; their composition recalling early botany collections you might see in natural history museums. Their realistic shapes and forms; curly octopus tentacles, plump lettuces, bulbous broccoli heads and the like, were also reproduced in bespoke wallpapers for the project. 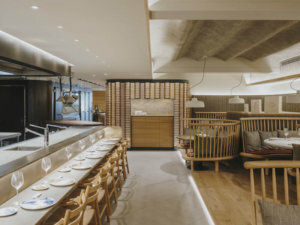 Elegant oak wood slatted screens, intricately interconnected to allow transparency and back lighting, demark the stairs to the lower-ground floor. 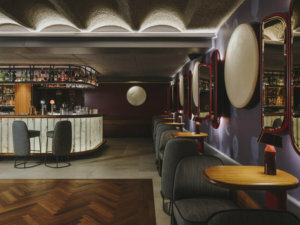 Called Impur; this intimate boîte has been conceived for cocktails and chatter. Strong claret tones in various materials set the scene for light-hearted decadence at the bar area. Moon- shaped sconces, created from alabaster by Lagranja, adorn the walls, next to atelier- like mirrors placed to add depth to the space during low ebbs. A small dance floor is a place to let loose after the unadulterated gastronomic experience that Pur offers, and Lagranja’s own Round armchair, provides the seating. 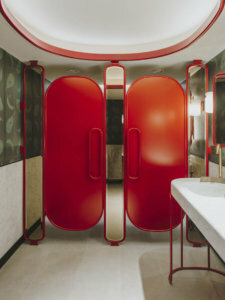 The washrooms are a burst of colour, with carved marble sinks that echo the luxurious ambiance of Impur.